March 13, 2018 March 14, 2018 by Margaret King . Posted in " In the Media " . 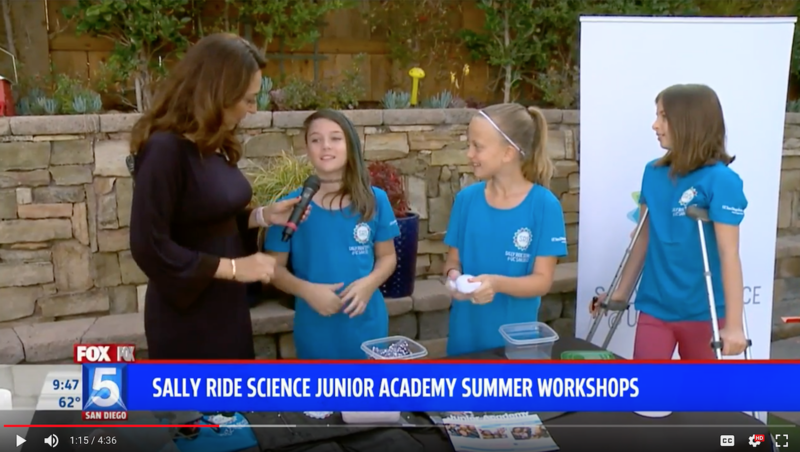 FOX 5 San Diego offered a preview of the Sally Ride Science Junior Academy, which is now registering students for hands-on summer classes, including dozens of innovative and exciting new offerings. The segment with correspondent Shally Zomorodi features Dr. Debi Kilb, a seismologist at Scripps Institution of Oceanography who is the science outreach director for Sally Ride Science, along with three enthusiastic Junior Academy students. The 2018 Junior Academy, from June 25 to July 20 at Mission Bay High School, will offer STEAM (science, technology, engineering, arts and math) classes for students entering grades 6 through 12. This summer’s academy features roughly twice as many courses as last year’s. Sally Ride Science, cofounded by America’s first women in space to promote diversity in science education, became part of UC San Diego in 2015 and launched the Junior Academy in 2016. Most classes have one week of half-day sessions, but this summer there are also new multi-week courses that allow high school students to earn college prep credit. Another new feature is an option to enroll students for early drop-off and late pick-up.